The Maritime Archaeological Society offers a number of projects ranging from historical research investigations to complex underwater surveys. There is sure to be a project suitable for everyone’s abilities and interests. Become a member to receive updates on our current projects. You can sign up for free or low cost training, and then participate at whatever level your time and interests allow. The Maritime Archaeological Survey Team (MAST) is a specialized team of professional archaeologists and trained volunteers that investigate reports of shipwrecks and other maritime archaeological sites in the Pacific Northwest. The team develops and implements plans to investigate shipwrecks and maritime related isolated finds reported by the public. Land-based and underwater archaeological technicians, historical researchers, remote sensor operators, and other support personal work together to study and document each site or isolated find in accordance with state and federal law. All the information that is gathered is forwarded to the state archaeologist for incorporation into the state database. Many of these sites or objects are visible for only a short time before they are covered again by sand and sea. Besides the MAST emerging projects, deliberate maritime archeological investigations are undertaken to document known or suspected shipwrecks and other maritime archaeological sites. The MAS newsletter will share details of ongoing and planned projects. 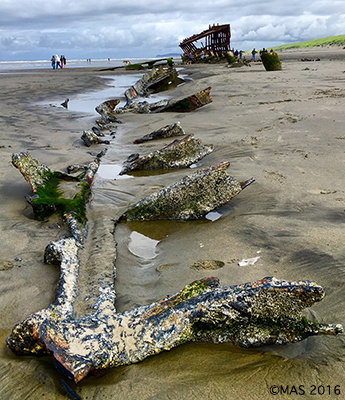 Photograph and drawing of possible ship or boat keel uncovered in Seaside, Oregon, November 2014. Courtesy of Christopher Dewey (pictured). Many research projects support field projects directly, but others serve historical purposes and do not involve fieldwork. Some research is conducted to test new archaeological procedures, practices, or theories. Is there a special maritime mystery that is important to you? Members can nominate new projects for the organization to research or use our facilities to conduct research on your own. We have access to specialized books and research techniques through various museums and research facilities. MAS researchers dig through old documents and microfilm in government agencies, museums, libraries, and historical societies. Read more about our Current and Upcoming Coastal Surveys here. Peter Iredale was a was a four-masted vessel that ran aground during a storm on October 25, 1906 near the mouth of the Columbia River. More details are available at the Oregon History Project. Read more about the history of the wreck and our ongoing Beeswax Wreck Project here. MAS Volunteers gathered at Nehalem in October 2016 for our Beeswax Wreck Project to do auger testing of locations found to have magnetometer anomalies in 2013.